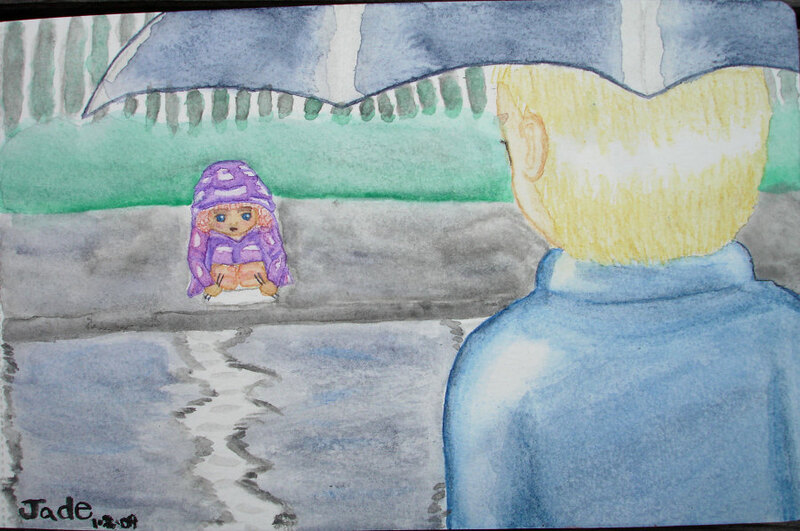 A watercolor illustration to an original short story/drabble idea I had after I received some watercolor pencils. It's raining heavily in the upscale community as the young boy is returning home, umbrella in hand. He's one of the only children that prefers to walk home from school, even on such gloomy days as today's. He tells everyone it's for exercise, or to collect his thoughts for his next musical piece, but really it's only to satiate his desire to escape. Every day his route ends with a long glance down the road where distant pine trees fade into the mountains, before making his way through his driveway's burnished gateway. Today is different, however. Aside from the clouds blocking any view farther than a half-mile, the young boy is surprised to find a young girl in a rain coat sitting next to his driveway, apparently focused on the paper before her. He stops and watches her for a moment before walking towards her curiously. As he nears he can see colored pencils in her hands and the box peeking out from under her coat. "What are you doing?" He asks politely. She looks up at him suddenly, then quickly returns her focus to her paper. "Watercolorin'." She simply states. He watches as she draws on the damp paper, the colors bleeding vibrantly across the page. There's only the roar of the rain for sound, and for a moment the young boy wonders if she had explained /why/ she was out here and he simply was unable hear it. After another minute of silence between them, he's sure that wasn't the case. "...*Why* are you doing this in the rain, in front of my house?" He finally asks, shaking his head slightly for emphasis. "I read that these watercolor pencils are very special -- that they're the only ones that you can use in the rain without the rain messin' it up." She looks up at the boy with surprisingly serious conviction. "The only one!" She exclaims, before turning back to her drawing. "But it's a waste... To have a title like that and never test it out. What's the point in having something like that, if you never draw in the rain?" The young boy stares at her quietly, unsure of how to reply. A minute later a plump, middle-aged woman comes storming down the sidewalk, her umbrella swaying forcefully with each step. "Maria-Catarina?! WHAT are you doing out here? Come home this instant; the Miss has been calling for you!" The young girl flinches at the voice and jumps up, scrambling quickly to collect her paper and pencils which have just now decided to make a break for it. The woman reaches the pair of children and takes hold of the girl's arm, scolding her for being out in the rain while leading her back to the house next door. The young girl tries to explain, but can hardly get a word in edge-wise. After a few more failed attempts, she sheepishly looks back at the young boy while mumbling 'sorry' to the still furiously talking nanny. The young boy continues to stand and watch them for a bit longer, before turning around to look at the clouds where the pine trees and mountains should be. He sighs softly before heading through the burnished gateway and up the driveway.